Here is my follow up Shooting Field Test video for my Cybergun Colt 1911 MKIV CO2 Table Top Review. During this Field Test Shooting video review I shoot 5 rounds of .20 gram Airsoft BB's through my Chronograph to find out the average FPS. I also step back 30 feet and setup my shooting stance by resting my hands on a sand bag and standing in the back for a fairly secure shooting position. As per most of my accuracy tests, I loaded my Cybergun Colt 1911 MKIV CO2 Blowback Airsoft Pistol with 10 rounds in the magazine to see what kind of grouping I could get on the paper target.. I was a bit surprised by the FPS for the Cybergun Colt 1911 MKIV CO2 Blowback Airsoft Pistol I tested. The claimed FPS by the factory is 360 using .20 gram BB's, the temperature outside was decently warm and I was using a brand new CO2 so I should have gotten fairly close the this velocity. As it turned out on this day the gun I was testing shot right around 300 FPS which is great for close quarters Airsoft games but perhaps a bit weak for the longer ranges of outside games. When it came to accuracy, I did find the Cybergun Colt 1911 MKIV CO2 Blowback Airsoft Pistol shot a bit high and to the left right out of the box but since it has a fully adjustable trigger this did not concern me. I was pleased to see that I was able to get a 2 inch 10 shot grouping from 30 feet back using a semi rested position which is about right for an Airsoft Pistol at this range. 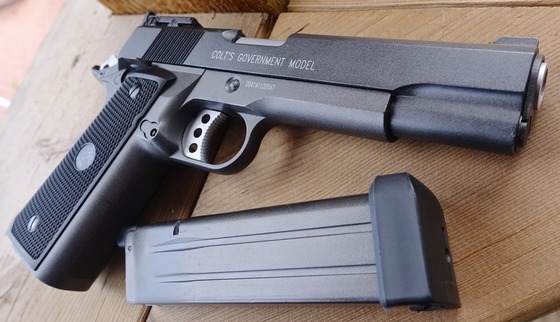 While testing the Cybergun Colt 1911 MKIV CO2 Blowback Airsoft Pistol I did not have nay mechanical problems, everything worked exactly as it was meant to , the Blowback was nice and crisp with that usually 1911 sluggishness I have come to expect. 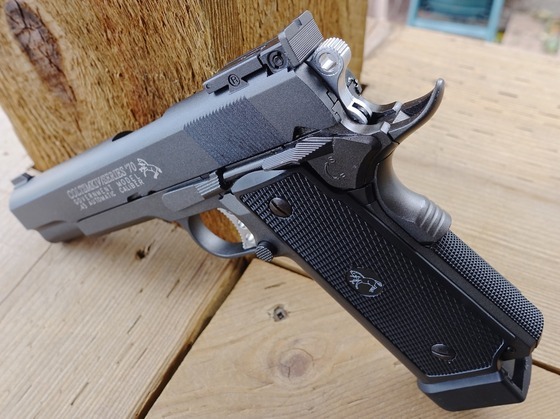 The trigger is pretty typical for a single action 1911 styled trigger which in some cases can actually be a little bit on the light side which with the Cybergun Colt 1911 MKIV CO2 Blowback Airsoft Pistol was not the case. Over all a really pleasurable Airsoft Pistol to shoot!